By the end of 2014, 37% of the 114-miles Jala-Badeba road will be completed; this will allow the more than 10 thousand vehicles that transit that road during weekends, holiday weekends and vacation time to drive close to the Riviera Nayarit. During an interview with the Riviera Nayarit Convention and Visitors Bureau (CVB), Jesus Miramontes, the director of the Center for the Secretariat of Communications and Transportations in Nayarit (SCT by its acronym in Spanish), indicated that the nearly 34 miles of road between Jala-Compostela will be finished by the end of the year, making it ready for use by summer 2015 at the latest. This progress represents 37% of the 114 miles that make up the new Jala-Banderas Bay highway, which is already 88% in use. 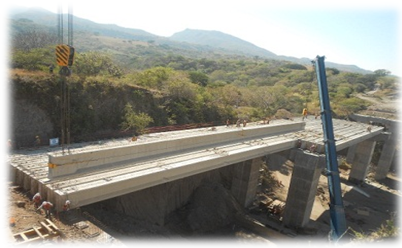 Authorities project the highway will be completely finished by 2017 at an estimated cost of 14 billion Mexican pesos. It will benefit the more than 20 villages that surround it. Jesus Miramontes calculates there will be between five and six thousand vehicles using the highway on ordinary days, but during weekends, holidays and vacation time there will be over 10 thousand cars on the road, which will reduce travel time by 50% once it’s completed. Two of the seven stretches of road that make up the Jala-Compostela highway are already completed; it must be noted the National Institute of Anthropology and History (INAH, by its acronym in Spanish) is getting ready to open up 100% of the remaining road, as there were archaeological finds in the area that needed to be explored. Construction on the Compostela 2 junction at kilometer 54 is ready to begin so it can join up with the Compostela 1 junction. In order to connect them a fork needs to be built; construction crews are waiting for the rainy season to end so they can quickly get to work. If the weather doesn’t cooperate, completion would be extended no later than the first semester of 2015. In the future, the road will connect to the Guadalajara-Tepic highway, the Tepic bypass and, eventually, with the Tepic-San Blas highway, bringing the state’s beach destinations closer to the domestic tourist, which will no doubt boosy tourism to the region.